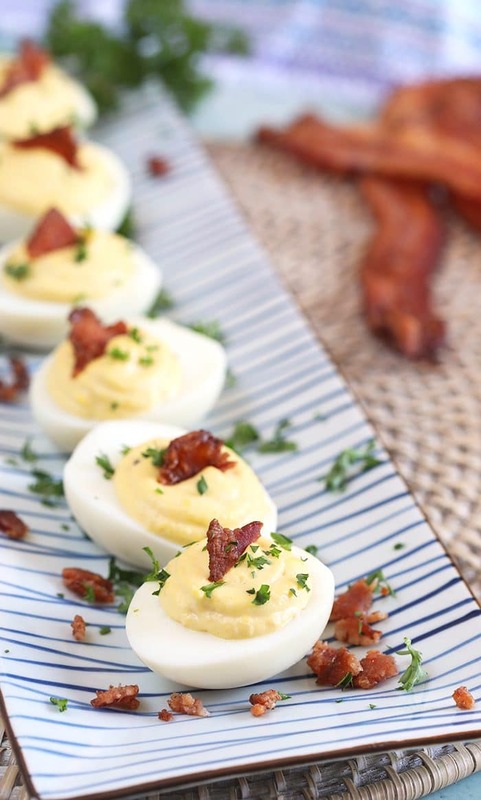 A fresh take on the classic deviled egg recipe, these Horseradish Deviled Eggs with bacon are creamy with a little kick of horseradish. 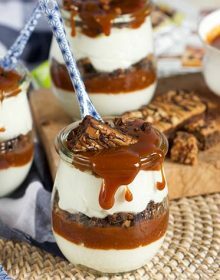 Easy to make in advance for parties, this is definitely a crowd pleaser. It’s springtime people…..bring on all the eggs. Deviled Eggs for me, please. Seriously, I could totally live on just about any Deviled Egg recipe around…the creamy filling perched perfectly on an egg white half. 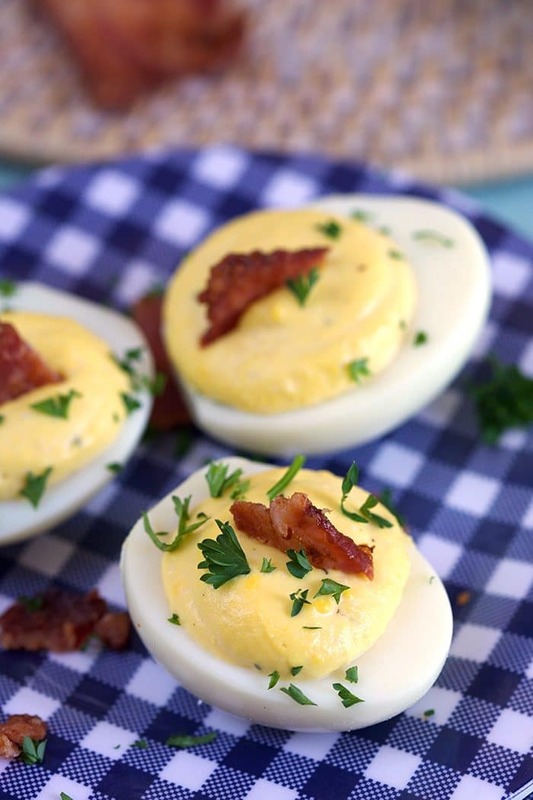 They’re so amazingly addicting and there’s not limit to how you can create your very own flavor combinations like these Bacon Horseradish Deviled Eggs. 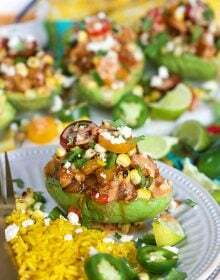 Deviled eggs are at just about every single family party I attend, they’re actually a priority and if the eggs are missing people can get very angry. It’s a weird phenomenon if you think about it. 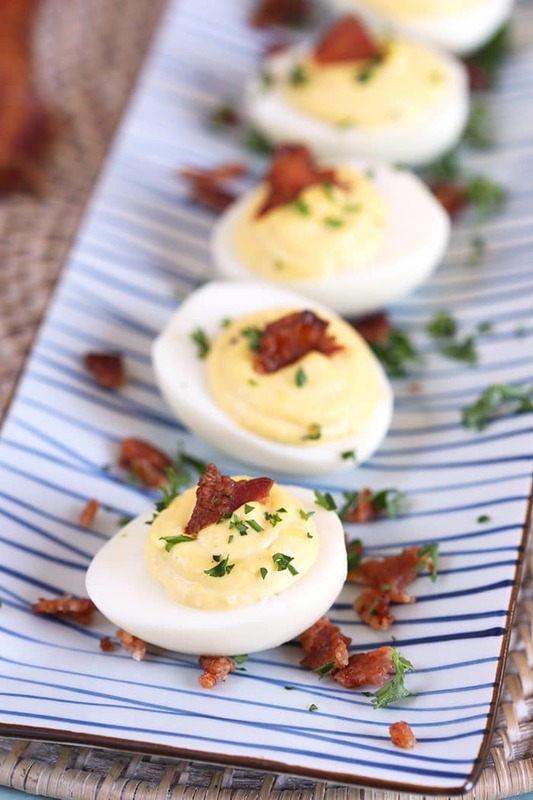 So, I started to play around with my deviled egg fillings and came up with a new favorite…..Horseradish Deviled Eggs with BACON! 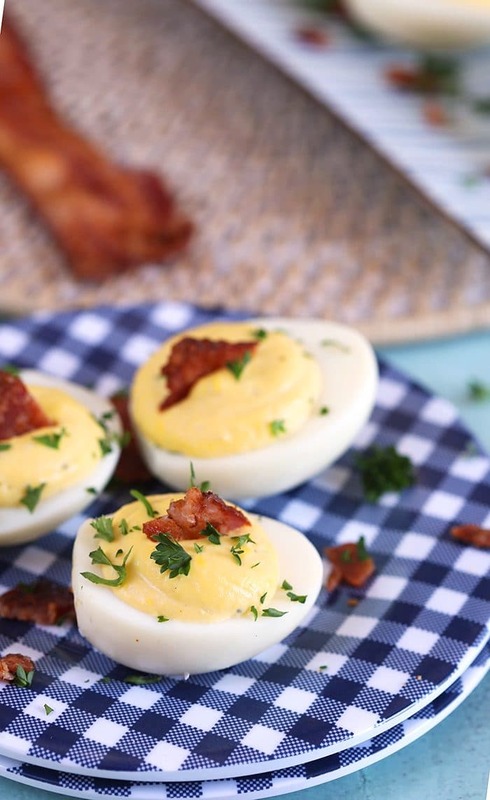 Besides the fact that bacon makes EVERYTHING better, these easy to make Horseradish Deviled Eggs are just a twist on the BEST deviled egg recipe ever. 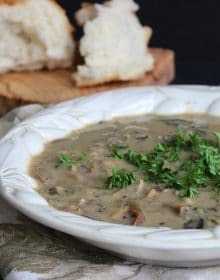 I’ve been, literally, making them for decades (that just made me feel really old) and people have always begged me for the recipe. It’s soooo good. Deviled Eggs are sooooo simple to make and, once you boil your eggs, come together in a matter of minutes. Lately, I’ve been making my hard boiled eggs using THIS tried and true recipe.….so easy and the eggs peel perfectly every single time. Peel the hard boiled eggs and cut in half lengthwise. Place the yolks in a bowl. Add the mayonnaise, mustard, onion powder, horseradish, salt and pepper. Beat the egg yolks until smooth and fluffy with an electric hand mixer. Fill a pastry bag or zip top bag with the corner snipped off with the egg mixture. Pipe the egg yolk mixture into the center of the egg white. Top with a sliver of bacon. 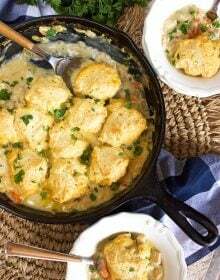 So, sooooo insanely easy to make. You can easily make your Horseradish Deviled Eggs up to 2 days in advance. 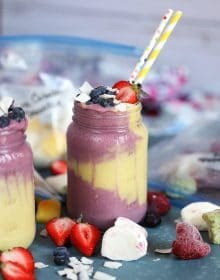 For best results, keep the filling and the egg whites separate wrapping the eggs whites carefully in plastic wrap and storing the filling in an airtight container. Refrigerate both until ready to serve. Fill the egg white halves up to 2 hours prior to serving. Is it okay to boil the eggs the night before? Yes, you can, absolutely boil your eggs the night before. 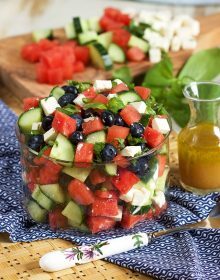 Be sure to cool and peel them, then store them in an airtight container or zip top bag in the refrigerator until you’re ready to use. Your hard boiled eggs will keep in the refrigerator for up to 7 days. Once you’re finished cooking your eggs, place them in an ice bath to stop the cooking process and help the egg shell separate from the egg white. This will make it much easier to peel your eggs without the traumatic sticking that keeps me up at night sometimes. Do Deviled Eggs go by another name? 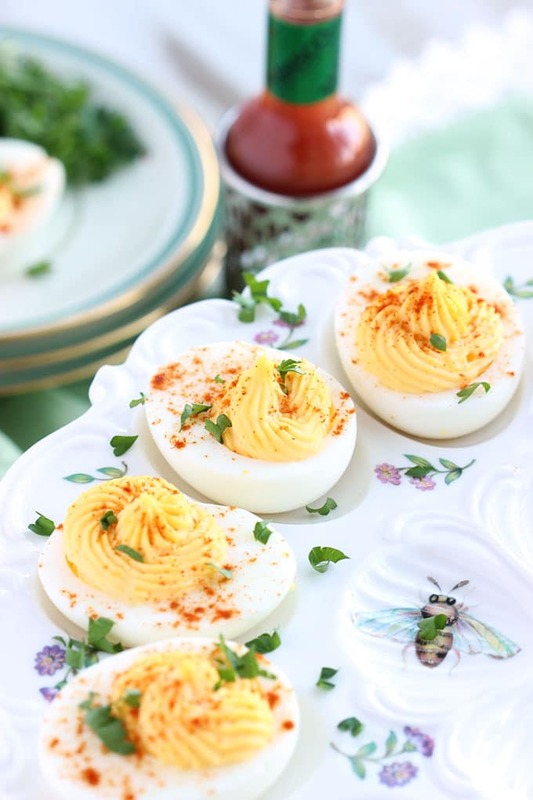 And here’s a little bit of deviled egg trivia for you…..did you know that Deviled Eggs go by another name? That’s right, Eggs Mimosa or Mimosa Eggs are the French version of the Southern Deviled Eggs recipe we all know and love. Eggs Mimosa is quite different in that the most of the yolk is grated over top of the egg…..which has been filled with something other than the egg yolk mixture we use in these Horseradish Deviled Eggs. You can fill your egg white halves with something like your favorite hummus or a relish of some sort before grating the yolks over the eggs. 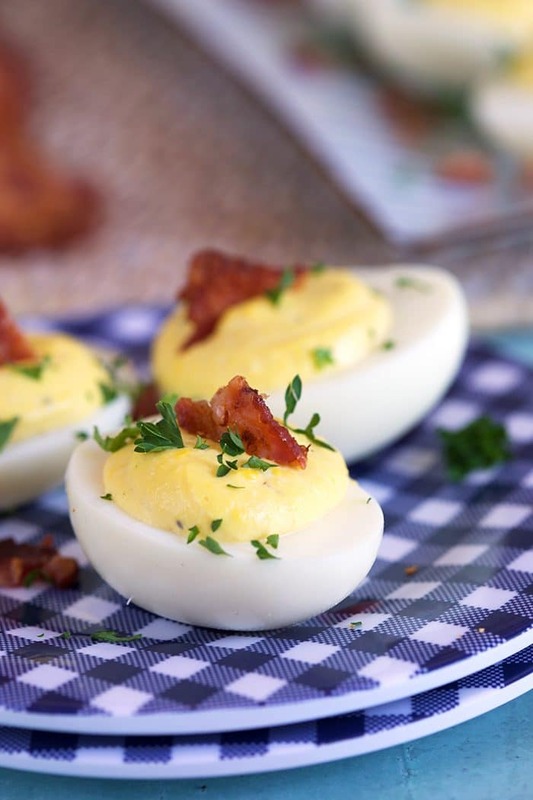 Deviled eggs are also known, simply, as stuffed eggs, Russian Eggs or dressed eggs….but whatever you call them, these amazing deviled eggs will never get old as your go-to party staple. What goes well with Deviled Eggs? Lobster Pasta Salad is next level fancy! 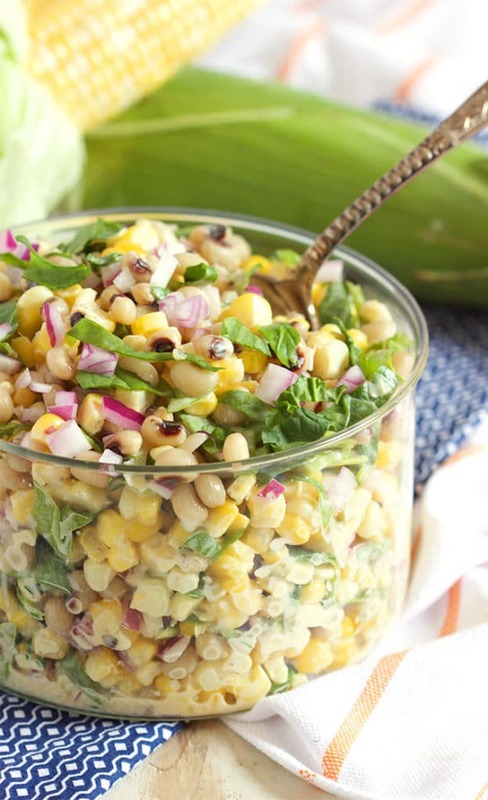 They’re the perfect picnic food for every occasion! 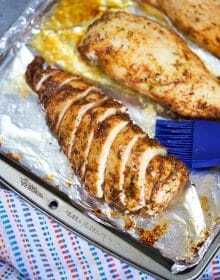 We also love to have them alongside this spicy BBQ Chicken and these FAMOUS ribs.….sooooo good, I don’t like to share. How do you cover deviled eggs? This is my favorite trick for transporting deviled eggs or even just storing your deviled eggs in the refrigerator until you’re ready to eat. 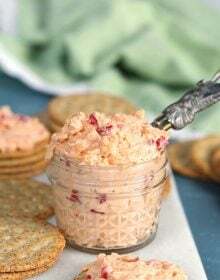 Place one Horseradish Deviled Egg with bacon in the well of a standard sized muffin tin. Repeat with remaining deviled eggs. Cover tightly with plastic wrap and store in the refrigerator. 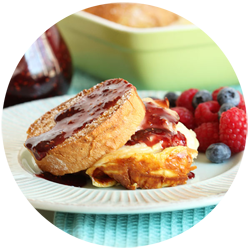 The muffin tin wells prevent the eggs from rolling and spilling the filling all over the place. Alternatively, you can place the eggs in the egg carton cup and fill with the yolk filling. Replace the lid and store in the refrigerator. Last tip, if neither of those alternatives work, you can place your eggs snugly in a small baking dish so they won’t shift, pipe in the filling and then place a toothpick into the center of each egg. Cover with plastic wrap and store in the refrigerator. Be sure to follow us over on Instagram for even MORE recipe inspiration and lifestyle tips! 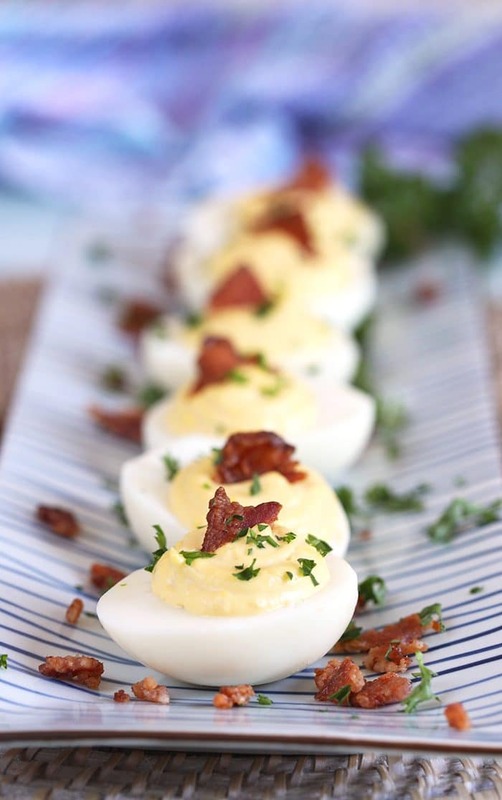 A classic made even better, Horseradish Deviled Eggs with Bacon are your new summer party staple. Cook the bacon until crispy, either in the oven or on the stovetop. Crumble. Set aside. Place the eggs in a large saucepan with enough water to just cover the eggs. Place the pan over medium high heat and bring the water to a boil. Turn the water to simmer and cook the eggs for 10 minutes. Carefully, peel the eggs and slice in half from top to bottom. Remove the yolks and place in a large bowl. 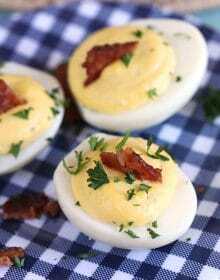 Add the mayonnaise, mustard, onion powder, Horseradish and 2 tablespoons bacon to the yolks. 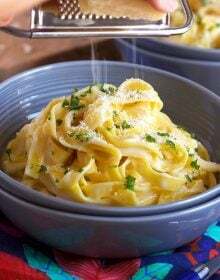 Using a hand mixer, beat the egg yolks until creamy and smooth. Season with salt and pepper to taste. Fill a pastry bag with the egg yolk mixture (or a zip top bag with the corner snipped off) and pipe about a tablespoon of the mixture into the well of the egg. Repeat until all the eggs are filled. Arrange the eggs on a platter and sprinkle with remaining bacon. Garnish with parsley if desired.